The message from Ukrainian and Russian citizens to people across the world. For everybody’s attention! Attention, everybody! Here is the message from Ukrainian and Russian citizens to people across the world. The more we look at the news, spread by international news channels, the more proof we get that the information, provided about tragic events of May 2nd, is exremely incomplete. It’s very important for us to share more details about the incidents in Ukraine. Why? Because the whole world turned a blind eye, as real fascism was grown and nurtured in the center of Europe. On May 2, the city of Odessa (Ukraine) became the place of aggressive confrontation between two antagonistic groups. Ukrainian nationalists jointly with football fans «ultras», who supported the provisional government in Kiev («nationalists», for short) on one side; and federalization supporters, defenders of rights of the major Russian-speaking part of the population, who are against the existing government due to its illegitimacy (shortly — «federalists») on another side of conflict. The existing government, which got into power by staging a coup against President Yanukovitch, as the result, has called them «separatists». International news channels tell that nationalists were not armed, but despite that, they started to fight with iron sticks, bottles with «Molotov cocktail» and some of them even used handguns. 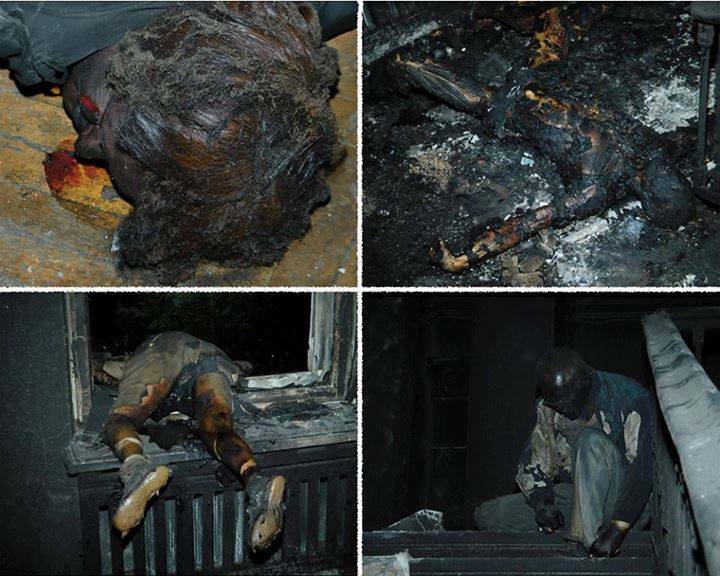 The police did nothing to prevent any beatings and arsons from any side. During the fighting on streets, the crowd of nationalists overran the federalists camp and chased people inside the House of Labor Unions. Then it was closed from outside, and set aflame with Molotov contails. Without any avenue of escape, many people burned to death there. Nothing of that was told or shown on international news channels. The real fascism showed its bestial appearance: people were burning alive, and those who were lucky to get out were savagely beaten, including those who jumped out from the windows. Many of them were waiting on the roof of burning building being told that they will be killed for sure. The only people who try to help were fire-guards; police, as it was said earlier, did nothing except observing from the side. This surrealistic nightmare killed at least 100 people. 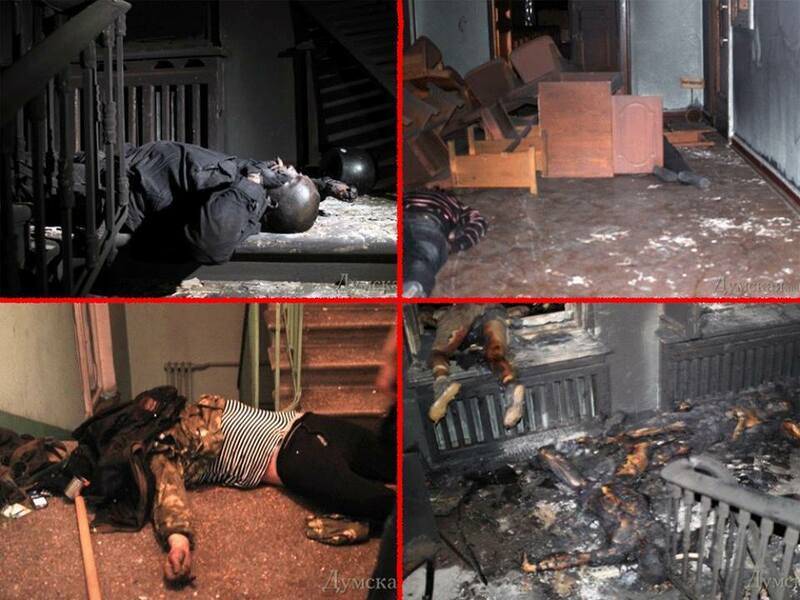 Then Ukrainian reporters and other onlookers scoured, the building, joking about burned bodies, calling them «niggas», robbed the bodies and uploaded photos and videos of their actions onto the Net. Official mass-media immediately started to disseminate disinformation, that there were no Ukrainian or Odessa citizens among the victins. This was quickly debunked, however, international news channels do not report that. The government proclaimed this act of murder to be an act of heroic patriotism. So, let’s summarize: the government, which got into power by a bloody coup, cheers the killing of its citizens just for their political views, and loudly calls the people responsible heroes. This is how a fascist state acts. By this time, govenment-supporting segments of social networks are full of malicious glee regarding the killings, jokes about burnt bodies, etc. Both the nationalistic part of the population and the parliament (no more than government’s obedient stooges at the moment) support the killings. No doubts, this is fascism, carefully nurtured inside the population. At the same time, but now in different areas — Slavyansk and Kramatorsk cities, the regular army started shooting at civilians. Officially, it is an anti-terrorism operation, but people have no any opportunity of evacuation, and the troops attack the civilian population indiscriminately. At the moment there is no reliable information on the exact number of victims. For Odessa the numbers range from 48 to 200 people, and for Kramatorsk from 12 to 70. It’s almost impossible to verify due to ongoing fighting. So it’s your choice — to believe in pretty news headlines or to call things what they are are: This is a real civil war against fascism. Open your eyes to the truth. You will not see it on the mainstream news channels. Stay connected to the real world and repost is as much as possible!! !